The PHCN-201 model has been discontinued. Please see the PHCN-70 as a possible alternative or contact our Flow Engineering Department. PHCN-201 is a simple-to-operate pH controller specially designed for applications where space or costs are a major concern. Thanks to its compact size of only 8 by 5 cm (3 x 2"), PHCN-201 can be mounted in confined spaces and right next to tanks or vats. The low cost of the meter will also make it possible for processes that up to now were manually maintained to be controlled automatically, saving considerable time and money. Measurements are displayed in large digits on the LCD and LED lights indicate the exact status of the controller, even from a distance. PHCN-201 also incorporates a bi-directional relay. Through a simple jumper on the rear of the meter, the operator can select acid dosage, which means the relay is activated with measurements above the setpoint, or alkaline with relay closed when measuring below the setpoint. In order to adjust the setpoint from 0 to 14 pH or to calibrate meter at any point on the scale, simply turn the relevant trimmer right on the front panel. The controller is easy to use and to install. 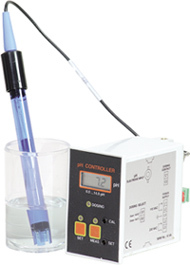 Any combination pH electrode with a BNC connector can be hooked up to the meter. The meters are available in three models to best suit your application. You can choose from the 100-110 V or the 220-240 V operated model. For those who prefer to operate at low voltage, there is also the 12VDC version with the transformer included in the low cost of the meter.